Which Instant Pot to Buy? Delicious Tested Recipes Sent To Your Inbox Weekly. 100% Free! Baby back ribs was one of the first dishes we made in our Instant Pot Electric Pressure Cooker. *Note: Normally, we make our baby back ribs with this Pressure Cooker Ribs Recipe using homemade dry rub and BBQ sauce. But, when we’re short on time or ingredients, this simplified version is our go-to Instant Pot Ribs Recipe. 1. 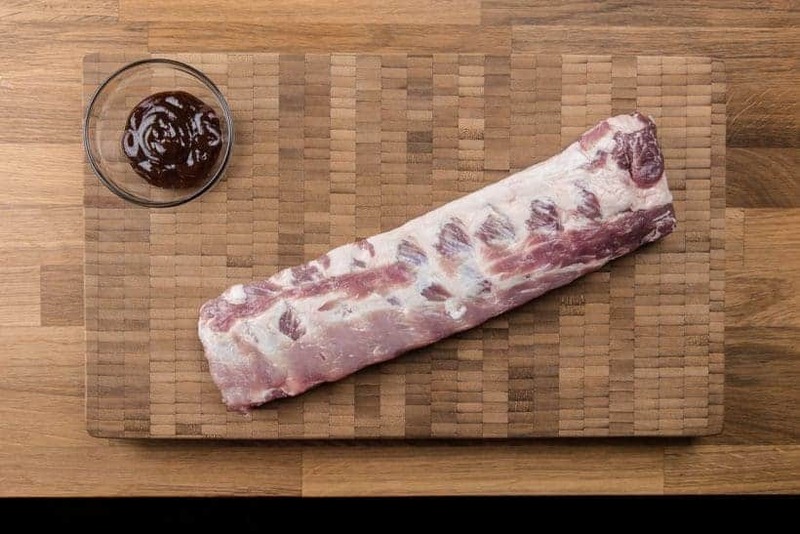 Purchasing Baby Back Ribs: search for ribs with even and uniform thickness in the rack. Try to find ribs with even marbling. 2. How long to cook the baby back ribs in the Instant Pot Electric Pressure Cooker? We had a little fun with some baby back ribs and tested different cooking times to find the best one that suits us. Choose your favorite cooking time here: Pressure Cooker Baby Back Ribs Cooking Time to make this Easy BBQ Instant Pot Ribs Recipe! 3. Cooking ribs directly in the liquid vs. on a rack in the pressure cooker:When cooking ribs in the pressure cooker, some of the meat flavor will transfer to the liquid. Place the ribs directly in the cooking liquid if you’re simultaneously making the ribs sauce in the pressure cooker. Because all the flavors that have escaped to the liquid will be brushed back onto the ribs. However, if you’re discarding the cooking liquid in the pressure cooker afterwards or using an already made/store-bought BBQ sauce (like this recipe), place the ribs on a rack in the pressure cooker to preserve the meat flavors. Locate the membrane on either end of the rack (at the back of the ribs). Slide a butter knife in between the membrane and bones (see picture below). Pull the membrane and tear it off with a paper towel (for better grip). Can’t see the cooking video? Watch it here. Now it’s YOUR turn to take out your pressure cooker and make some Easy BBQ Instant Pot Ribs Recipe! Craving more? Subscribe to Pressure Cook Recipes to get our newest recipes delivered straight to your inbox. 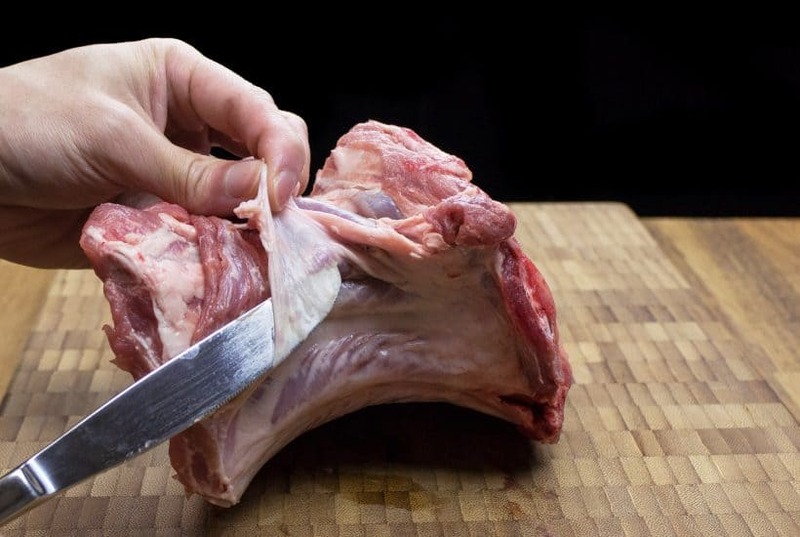 Prepare the Baby Back Ribs: Remove the membrane from the back of the ribs with a paper towel. Season the Baby Back Ribs: Season the Baby Back Ribs with generous amount of kosher salt and ground black pepper. Pressure Cook the Baby Back Ribs: Place 1 cup (250ml) of cold running tap water (or apple cider vinegar) and a trivet in the pressure cooker. Place the baby back ribs on top of the trivet. Close lid and pressure cook at High Pressure for 16 – 25 minutes. Adjust the timing according to your preference: 16 minutes (Tender with a bit of chew) to 25 minutes (Fall off the bone). Turn off the heat and full Natural Release. Open the lid carefully. Preheat Oven: While the baby back ribs is cooking in the pressure cooker, preheat the oven to 450F. Apply Sauce and Finish in the Oven: Brush your favorite BBQ sauce all over the baby back ribs on all sides including the bones. Place the baby back ribs with the baking tray in the oven for 10 – 15 minutes. Serve: Remove the ribs from the oven and serve! *Note: this recipe is meant to be super basic & simple - a great easy starter recipe, especially for new Instant Pot users. Feel free to modify it to your taste. Food Lovers in our 30s who worked directly with Instant Pot CEO, Manufacturers, and 35+ Restaurants. Culinary Families & Food Magazine Publishers. I made these for lunch. I have had an IP for a while, and just have not used it. But, I realize I need to, so decided to make ribs, and found this recipe. Used water and root beer in the IP. A little rib rub. High for 30 minutes with 15 minutes of NR, then QR. On a pan, slathered with sauce. In a 425 oven for about 15 minutes. Perfect. Thank you for a recipe that made me feel confident that I CAN use my IP, and make great food. I made these ribs tonight. They were amazing. The only problem I had was after 20 minutes on pressure and nr 15 minutes they were not done. I marinated with rub last night, not sure what type of ribs(2) but they wrapped around my 6 quart but were tight fitting. I figured that was the reason so pressurized another 10 minutes with nr 11 minutes and this time was tender and not falling off bones which is the way I like them. I love ❤️ your recipes. I love your recipes. Thanks for all the hard work you put into them. I made the ribs tonight and used Pork Loin Backribs and they came out a bit dry. Not sure if that’s the same as Baby back ribs. I had 1 rack of ribs. Cooked for 17 min + 17 min NR. (I lost track of time. So, the 17 min NR was a coincidence.) Broiled for 10 min. Maybe I broiled it too long? I am trying the receipt for the first time, what do you do with the liquid smoke? The liquid smoke can be added to the water at the bottom. Thank you for your question. Marinating the pork ribs with BBQ sauce will have minimal impact as the marinade will only be able to penetrate a very thin layer. You can just apply the ribs with BBQ sauce and serve them if you prefer. I’ve had my IP about 2 months now and tonight is the 3rd time cooking these ribs….the entire family BEGS for them. I shove 3 racks in there and cook 20 mins with a natural release of approx 30 mins and the results are phenominal fall off the bone deliciousness! Thank you for this simple, yet scrumptious recipe! Thank you so much for your kind words on the recipe! My 8qt IP didn’t come with a trivet. What type of trivet do you recommend that I buy? What type of pans should I use in my IP for recipes that need to be cooked in a pan? Thank you for your question. 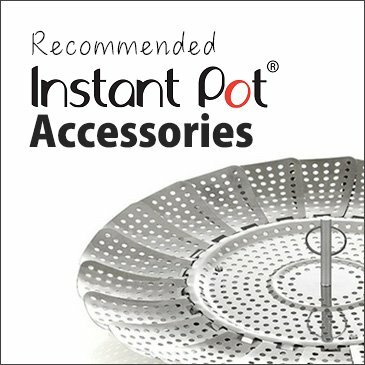 Please see our recommend Instant Pot accessories here. Hi Amy and Jacky. Not sure my last question posted. Using the 8 quart for the first time to make ribs. 8 quart says you have to use two cups of liquid. Will this change the cook time??? Or do I use 1 cup???? HELP, I am having family from the opposite coast. I am making an Amy and Jacky feast. My altitude is 4646 feet what adjustments need to be made when using my IP? You will want to follow this altitude chart here. I’d love to make these tonight, but I do not have any basket or trivet to put ribs in/on. Can I just place them in the instant pot and cook the same otherwise? The Instant Pot should come with a trivet. You can use that one. Placing them directly in the water will be fine, but the ribs will lose some of the flavor. How long (minutes) should one cook country style ribs? For country style ribs, you will want to add roughly 5 – 6 minutes. I made these ribs tonight with a few adjustments. I added 48 Oz of liquid, cooked one rack of BBR which weighed 3.12 lbs. I cooked them at high pressure for 25 minutes and waited 55 minutes for the natural release of pressure. At that point I used the quick release method. There was a tiny bit of pressure left. The meat was cooked too long and fell off the bone. It tastes amazing but I wanted it to be tender and stay on the bone. I have another slab to do tomorrow. I’d like to get it right. Should I shorten the cook time? Use a quick release method? I’m using a 6qt IP. I want to put the liquid in and I think that’s what goofed me up. Tomorrow’s rack is 3.72 lbs. Thanks for your help! Sorry for missing your question. 48 oz of liquid (6 cups) was the problem. Only 1 cup of water is needed (no matter how many ribs or size of the ribs). Please take care & have an awesome Sunday! wondering if you recommend oven setting to be Bake or broil? Do you have a trivet you recommend? If you are using the Instant Pot, it should come with a trivet. If not, the steamer basket on this page is what I recommend. I’ve bought an IP and the rib recipe will be the first thing I’ll try. In the past I would coat the ribs with a dry rub and cook in a standard Slow cooker for 6 or so hours , then BBQ with a wet rub to crisp them up. My question is can I apply a dry rub when using the IP with your method ? Dry rub will work fine. We have this dry rub version & BBQ sauce version if you are interested. Just got my first IP and this site was recommended as a good one with tested recipes. This will be my first one to use. I do have a question for a future use. Are the ribs fully cooked and oven is really for finishing / carmelizing. Essentially wondering if you can do this step earlier in the day and refridgertate to finish later if you wanted to make other dishes or rice for a dinner. The ribs are fully cooked in the Instant Pot. you can do this step earlier in the day, but it will be slightly drier as some moisture will be loss due to refrigerating. I was pressed for time the other night and had a rack of pork back ribs in the freezer. I came across this recipe, thinking “it sounds easy enough” and it totally was!! This was my third time using my IP and I absolutely love it!! One thing I had to ask is how do you get the ribs to fit in the 6q IP?! I had to cut them down (It was a pretty large sized slab of ribs) and STILL do two batches!!! Nevertheless, thank you for posting this yummilicious recipe. Am totally sharing with friends and family. You can coil the ribs to make them fit. Just make sure not to pack them too tightly. thank you for your comment. I have added your email to the mailing list. Please check your email for the confirmation email. I want to make bothe chicken and ribs. Can I do both at the same time in the instant pot? I’m open to using either boneless skinless or bone in for the chicken and baby back ribs. You will want to use bone-in skin-on chicken thighs as you will be overcooking the chicken thighs at ~16 minutes of pressure cooking. 1. is it possible to make this using regular ribs (not baby back)? Does the time need to be adjusted? 2. I see a lot of recipes where it’s falling off the bone when taking it out of the IP. what would you recommend for the cook time if I don’t want it falling off/overcooked since i would finish the cooking in the oven? 1) It is possible to use regular ribs. It will depend on the cut. Side cut (with a lot of fat and marbling) will take roughly 15 minutes and 10 minutes Natural release. Spare ribs will take roughly 18 – 20 minutes Natural Release. 2) The 18 – 20 minutes timing should work for spare ribs without them falling off the bone. Take care & have fun cooking! Awesome recipe!! I just have a question – if I wanted to make more than one rack of ribs at a time, what modifications do I have to make to the ingredients and cook times? You can just coil the ribs in the Instant Pot. The cooking time will be the same if the ribs are not packed too tightly. We tried this recipe for Father’s Day and it was GREAT! We used apple cider vinegar as suggested for the cooking liquid and since we like a less sweet BBQ sauce, we used Napa Jacks Bourbon BBQ Sauce. (A little expensive, but more vinegary than sweet and excellent.) We had five racks of ribs which we cooked in the Instant Pot in 3 batches the day before. The ribs went in the fridge for the next day when we heated them in the oven a little longer than recommended to take the chill off. A great make ahead meal that got rave reviews. Thank you for a great recipe! This way, we will not lose any of the meat flavor in the discarded water. It will be more time consuming, but your method will work better assuming all the reduced liquid is applied to the ribs. This recipe has worked so well for us with entertaining parties in our backyard. I can fit 3 half-racks of baby back ribs in our 8L IP at a time (we do a few batches). I love your idea of apple vinegar in the pot instead of water! I coat the ribs with a dry rub the night before, then pressure cook for 16 min with full natural release. Then brush on BBQ sauce and finish off on the grill. Fabulous every time! We just had this recipe a few days ago as well. 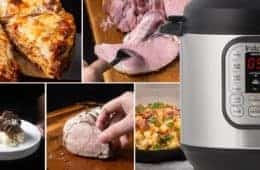 Was this recipe copied from Instantpot.com, or did Instant Pot copy from you? Its word for word from their site. Both are our recipes as we worked with the Instant Pot manufacturer. If you look at the recipe on the IP site, it will have a credit saying the recipe is from us. Finishing on the grill will work great! I was watching my recording of the Royal Wedding and noticed it was after 4. Nuts, I was going to have ribs for supper. I approached the Instant Pot with trepidation. When I said I wanted pot for Christmas, this is not what I meant. But I had the ingredients for this recipe and they turned out great. Glad to hear the Ribs turned out great. 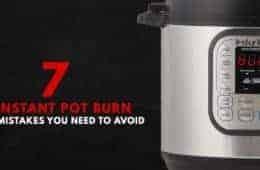 I have recently purchased a 6 qt Instant Pot Ultra. This particular model does not have a manual button. It has a central dial for program selections and settings. Do I use the Ultra setting for the ribs and select 20 minutes? Or can I use the Meat/Stew option? The manual button has been renamed as the pressure cook in recent models. If wanting to use the liquid smoke, do you put it in the water or what? Don’t see any mention as to where to use. The liquid smoke can be added to the water. I was hoping someone had already asked this, but…no luck! My dear sweet husband bought precooked & seasoned baby back ribs (I’ve asked him to please not do this again! ACK) Am I still going to be able to use the pressure cooker to make them? The directions say to cook them @ 400 for 20-25 min in the oven. Thank you for any advice!! Yes it will be fine. I just got my instant pot. It’s a small one because I live alone. Also don’t have an oven! So I’d like to know about modifications for the smaller size pot and also some sort of filter so I can find recipes that don’t need the oven or stove top at all. I don’t mind if it’s just to brown the topping in the oven but I was drooling over this recipe until I got to the end where it says to finish it for 10-15 minutes in the oven — which made me think it might not even be cooked enough just in the instant pot. 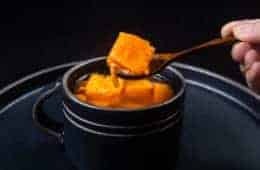 For recipes with a lot of liquid such as chili, soups, pasta, congees, stocks…etc, you will want to cut them by half in the 3qt. The cooking time will stay the same! Do let us know if you come across any questions! I just received my IP as a gift. Have not used it yet. But your recipes look so good that I am sure I will be trying them. I have a question however. My IP is the 3qt mini. What adjustments do I have to do? Thank you! Congrats on your new IP and thank you for your kind words. Hi, I absolutely love this recipe and have made it several times! I am entertaining and have 2 racks of pork back ribs cut into 3 bones per piece. This is a large amount so a) can I stack the ribs on top of each other on the trivet in the pot and b) can I cook one batch first and then do them both in the oven at the same time once the second batch is done in the pot? Thank you for the wonderful recipe!! The ribs can be coiled in the Instant Pot and cook at the same time. The cooking time will be the same. Followed the recipe fairly closely with the apple juice and apple cider vinegar for 17 minutes and natural release. Followed by 10 minutes in the oven at 450F slathered with barbecue sauce . They turned out perfect. The only thing that I did differently, instead of using a steamer tray, to lay the ribs on I put them on a layer of small potatoes . After cooking these made excellent mashed potatoes. Great idea with the potatoes! Am in need of advice please. Instead of buying a rack of ribs, Mark bought 800g fresh, individually cut, ribs. I’m sure the cook time will significantly differ from a rack of ribs. I did read comments first but no one had asked this question. (Individually cut ribs are always available in the UK… my frustration is that racks of ribs most times already have a seasoned coating which is not good for us Coeliacs as I’ve had ILLNESS from consuming said pre-prepared ribs). Unfortunately, local butchers are not savvy about food cross-contamination either. At least suoermarkets have to be ‘clean’ certified. Hence Mark buying pre-cut ribs. Phew. That was long-winded 🙂 Hope you can help. So happy to hear from you again. Is the cut baby back ribs or spared ribs. I would decrease the cooking time to about 9 – 11 minutes and natural release for baby back ribs. P.S. I wonder if you could add Salt & Pepper Ribs to your potential future recipe list. I’ve only tried one recipe in the oven before and it was a disaster lol. Can’t promise if we can get it done as Salt & pepper ribs are more of a stovetop recipe, but I have added it to our super long to-make list. Another hit J&A! I think I made this recipe word for word when I first got the IP last year and it was good then but today, I took it to the next level: In addition to your recipe, I opted to use 3/4 cup apple juice and 1/4 cup Apple Cider Vinegar for my liquid instead of water. In addition to salt and peppering the meat, I generously sprinkled a pork rub spice mixture from Costco prior to cooking. The addition of some liquid smoke in the store bought BBQ sauce took the whole thing to a new level of perfection. The smell of vinegar is pretty strong as you cook so beware if you are entertaining at the same time you are cooking this. But it will be obviously worth the temporary vinegar smell when you taste the sweetness of the vinegar and apple juice infused pork. I cooked the ribs for 20 mins and natural release for 20. The meat was falling off the bone. If I was to finish this on a grill, I would consider cooking only 15-16 minutes so that the meat won’t be so delicate to handle. Your next level modifications will be super helpful to our readers. Are the boneless ribs chopped? Take care & have a great weekend! I don’t have liquid smoke. Do you think putting apple juice in bottom along with a bag or two of lapsing souchong tea for smoke flavor would be ok? Would bags burn? I want to put bbq sauce on before oven step. The bags will not burn and the lapsing souchong tea will add some smokey flavor for sure. I have a rack of Costco rubbed ribs, frozen. How long should I cook frozen ribs for? Frozen ribs should be at least partially submerged in the cooking liquid. The cooking time will be the same! I’m so impressed that you guys have so many answers to questions! Nobody else on the internet knew how to cook frozen ribs. You guys are magic. It’s good to hear from you again. I am new to IP cooking and have never made ribs before. Does it matter if they are pork or beef? I didn’t know there was a difference and I bought pork. Make sure it is not Pork spare ribs as that will take a bit longer as well. Amy and Jacky, once again I have the happiest husband in the world. He just did the happy dance as he ate his ribs. Tonights are left over from last night and he took a bite and said out loud “the ribs are so goo” as he did the happy food dance. These were SO easy. We finished them on the BBQ rather then the oven, five minutes each side. I’ve always been intimidated by trying to cook ribs. Not anymore 🤗 thanks to you. My husband RAVED about them when I made your recipe. I am cooking them again today. Thank you for this wonderful recipe and all you do. *High Five* on the Success! I’m making my ribs tonight and I always use orange juice in the bottom of my pan when coin the oven. Can I use orange juice in the bottom of the instant pot? Sorry for the delay in response as we are in the middle of moving. Orange juice will work fine in the Instant Pot! St Louis style ribs is more lean and tough. It will take roughly 5 – 8 minutes more. Hi. It took me about 30 mins for the full Natural Release. Is that normal? I had 2 racks in for 21 mins and they’re falling of the bones literately. Could it be the long release? How do I also avoid drying the ribs after the oven bake? Mine came out a bit dry as against the juiciness it had before the oven bake. Yes, it was the long release that does that. The natural release time will vary depending on how many things are in the Instant Pot. It will be fine to release the rest of the pressure if the floating pin doesn’t drop after around 15 minutes. The longer natural release time will also make the meat drier. The best way is to place the ribs under the broiler just until caramelized. Great ribs loved them, I did 26 mins pressure, then full NR, the natural release took 29 mins does that sound about right or could my pin been stuck a bit ? Ribs still were fall off the bone but dinner was delayed a bit I had not had planned for that much NR. I had two racks coiled and the 1 cup which was apple juice and cider vinegar. Either way they were great. Just was wondering about the NR time ? This recipe turned out so good. My father, who normally isn’t easily impressed, gave it 10 1/2 stars. I had two pretty large spare ribs racks, so I cooked mine for 31 minutes and they were fall off the bone delicious. Thanks for the recipe! Happy New Year to you and your family. I was gifted an IP for Christmas and I love it already! I was lucky enough to stumble upon your website the day I got it and everything I have made has turned out phenomenal! We made these ribs for supper and they were amazing! No need to go to a restaurant for these anymore! Thanks for all your great tips, tricks, and easy steps. I think I have made hard boiled eggs and steel cut oats at least five times already! Keep the recipes coming! So happy to have you on our site. Thank you so much for your kind words. Thanks so much for the great recipe, I made this once so far and they turned out great! So good, we’re making them for Christmas this year. Quick question, I need to make 3 racks but only have one instant pot, any suggestions on the best way to make these? I was thinking of making them one at a time and then doing the oven part once they are all done. You can cook them together if you can coil the 3 racks together and fit them (not too tightly) in the Instant Pot. I will use 20 – 21 minutes + 10 minutes Natural Release for the cooking time. We wish you & your loved ones a Merry Christmas & many blessings to come in the New Year! Thank you for all your recipes & efforts! I took the middle road & did 20 mins & they totally fell off every bone. Next attempt, I’ll do 15 mins! Wish you & your loved ones a Merry Christmas & many blessings in the new year! I’ve made this a few times. I’ve used the method where you make the bbq sauce at the same time. It’s much better than cooking ribs in the oven. I’ll go with this fool proof method as it tastes amazing! I love Ribs from the Instant Pot as they are so easy and yummy to make. Take care & have an amazing Sunday! Yes, you can use two rack of ribs by coiling them. The cooking time and liquid will stay the same. Thanks for the quick response. I was able to make them before work this morning. I placed the cut ribs in ring fashion around the steamer basket and cooked 26 min plus NPR. The result was a nice chew, not yet fall-off-the-bone. We loved it. So easy and delicious. So happy to hear the result. I bought a rack of spare ribs only to find that the butcher had cut it into small segments (2 bones each). Can I still use this recipe? Spare ribs is more meaty and leaner than baby back ribs so it will take longer to cook. I would recommend 25 – 28 minutes + natural release. I just received a pressure cooker (not an IP brand) and would love to surprise my husband with ribs for dinner. I notice IPs come in different pot sizes – the one I received is a 6 qt. Can you tell me if this recipe will work as is in a 6 qt pressure cooker or would I need to break the ribs into smaller portions (2-3 ribs per) to fit them in? Also, if I have to break them down, does that affect the cooking time at all and how should they be placed in the pot? Thank you in advance and I look forward to trying out many more of your recipes. For ribs, it is better to cook them without breaking them. This recipe was developed in the 6 qt pressure cooker and will work for 8 qt as well. This was the first recipe made in my Instant Pot and was a great success. Thanks! Yay! Congrats on your new Instant Pot and thank you for using our recipe as your first meal! Thanks for the recipe. The ribs turned out great! I’m a total novice but do you think adding things like liquid smoke or worchestshire sauce mixed with the water would increase the flavor? The effect will be minimal as the meats are not directly submerged in the water. For a full blown recipe, you may be interested in this one. 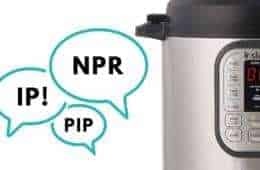 Does cooking with the DUO80 Instant Pot change any of the timing vs the DUO60 Instant Pot? If I am bringing the ribs to a friend’s house and want to put it in the oven there – is it okay to have some time (30 mins or so) in between when the ribs come out of the Instant Pot and go into the oven? The cooking time & liquid will stay the same for this recipe. The ribs will be slightly drier, but it will be fine. This is the best rib recipe we have ever tried. We do have leftovers. Any suggestion as to how to reheat them? Thank you. I would wrap them in foil and reheat in an 325F oven. OMG!! I had to come back and let you know that I tried this recipe and it was really really good. My whole family loved it. 🙂 Thanks for sharing it! I’ll definitely be making this again. I did the 16 minutes and two slabs of ribs. I am cooking two ribs and will put them on top of each other like in a circle. I want to try your 16 minute cooking time will this be the same for 2 slab of ribs or do I need to double the time up as well? Thanks. We got together at work and purchased a pressure cooker, we have experimented with ribs and found that we like the ribs as tender as possible. We cook them for 53 to 55 mins with a manual release, this makes them where they are just about to fall off the bone. If we do an automatic release can we cut cook time and still have the tenderness we love? Is so what cook time should use? For baby back ribs, it will be fall of the bone with 25 – 28 minutes + a full natural release. Hello! I recently purchased an Instant Pot an have had great success. Your site is great. Tonight I’m making your potato salad and easy ribs! I am not a cook so I am learning as I am going. When I bake these in the oven at 450 degrees. Is the rack in the middle? Or if I broil it do I put the rack on the top and reduce the time? Thank you! The longer the ribs are in the oven, the more internal moisture (juice) will be lost. So the ribs should be put on the top rack to speed up the caramelization on the outside. I just made this recipe and let’s just say it blew my mind how EASY and DELICIOUS it was!! It was my first time pressure cookin’ in a newly purchased pot and I must say I will definitely come back to your site for more!!! Thank you for the video on top of this and making this site beautiful, your hard work is much appreciated!!! Congrats on your new Instant Pot and thank you so much for your kind words! Please let us know if you come across any questions. Hello again! I love your website and your q&a section. I lover that you respond so quickly! I bought baby back ribs today just so I could make this recipe. The butcher, without asking me, cut it lengthwise. Can I still make it the same way or do I need to make any adjustments? Thanks again! If they are lengthwise, I would recommend reducing the cooking time by two – three minutes. This is way too easy to be called a recipe! Again, your instructions make it simple and tasty. Thanks for all your hard work. Hmmmm, is it really work? Seems like there is plenty more rewards than work. If the ribs is frozen, I would recommend submerging it in the cooking liquid (Add some seasoning as water is a little plain). The cooking time will remain unchanged. Hi, I have a rack of frozen baby back ribs and don’t have time to thaw…what’s do you suggest? Thank you in advance! I would recommend submerging the ribs into the liquid partially. Thank you for recipe. I replaced the water with Dr. Pepper and added 4 chicken thighs…had a wonderful dinner. Pressure cooking for 19 minutes — the ribs and chicken were perfect. Gave some to my neighbors and they LOVED it! Cooking has never been so easy. How do I make them if my pressure cooker doesn’t have a rack to put them on? Will it hurt if they are cooking in the liquid? It will dilute the flavor of the ribs so I would cook the ribs in flavored liquid like this recipe. we are still new to IP cooking. So far All YOUR recipes have become new faves. Tonight we tried the ribs as a future weeknight meal. Wow! Used the raspberry chipotle BBQ sauce! I am fast becoming a Pork fan as well as a devoted IP user with your help! Still need some good chicken recipes. Glad I found your recipes! Thanks. Thank you so much for your kind words Ruthie!! Thanks so much! This was amazing! My family wanted more more and more! This is only my second use of the IP and I just had a general question. When the timer clicked off after the 25 mins cook time, did it automatically go into NPR? Or do I have to do something to switch to NPR? I assume no. Am I supposed to see steam coming out during NPR? I didn’t when I made the ribs. After 15 minutes, I manually released to avoid overcooking. Thanks again. Your pictures of food on your website are so amazing! thank you for your kind words and question. The pressure cooker will Natural pressure release after the cooking cycle has finished (You won’t see any steam coming out). For meat recipes, it will be safe to release the remaining steam by turning the venting knob to the venting position after 15 minutes. What’s not to love about a recipe that calls for water, salt, and pepper (all three are always on hand! ), ribs and BBQ sauce (good and affordable, thanks to Costco)? I make these every few weeks, maybe more. It’s SO easy, SO good and my kids love it. So happy to hear your kids love the ribs also! Hi! This sounds great. I can’t wait to try it. Just wondering, could I make the ribs in the instant pot ahead of time (say during my children’s afternoon nap) and then finish them off in the oven right before serving (at dinner time)? If so then do I need to modify the recipe? Thank you!!! That will work as some readers have made them in the Instant Pot and take them to a camping trip. It will be slightly drier, but it will work without any modification. Thank you for sharing the recipe. I made this today, it was delicious! Take care & have an amazing weekend! Just curious, what is the purpose of removing the membrane first? Can’t wait to try this! So happy to hear from you again :)! The membrane kind of doesn’t taste good and it will be harder to remove after pressure cooking. It states use a trivet, but my 6 quart pot came only with the steamer rack. Are they one and the same? The steamer rack will work the same way. I don’t have a vegetable steamer. Can I cut up the ribs and place the ribs inside the bowl, and then put the bowl on top of a trivet? Thanks! It will be best to place the ribs directly on the trivet. Is there a way to double this recipe? Yes, you can double the recipe by coiling the ribs together loosely. As long as they are not packed tightly together, the cooking time can remain unchanged. Can I cook pork ribs and beef ribs together in the instant pot? Cooking Pork ribs and beef ribs together will not be ideal as beef ribs will take 35 minutes and pork ribs will be overcooked by then. I recommend cooking them separately! When you say “Turn off the heat and full Natural Release” does that mean that when it’s done pressure cooking to press the Keep Warm/Cancel button so the display says “OFF” and then let it release naturally OR do we keep it on the Keep Warm setting until the pressure releases? Both ways will work the same as the actual keep warm function will kick in at a temperature well after the natural release. So happy to hear that. Take care & have an awesome week ahead! These turned out really dry for me. I cooked for 25 minutes. What did I do wrong? I followed the directions exactly with one rack of ribs. It sounds like it has been overcooked or wrong cut of meat was used. These are the two reasons I can think of off the top of my head. 1) A quick release was used. 2) The rack of ribs was not baby back ribs as Baby back ribs are quite fatty and should have some leeway for overcooking. Hi! If I want to finish these on my propane grill instead of the oven do I use high or medium high heat? Direct or indirect heat? About how many minutes per side? Thank you so much, can’t wait to try! It’s great to hear from you again 🙂 Hope you have been doing well. You will want the highest heat and shortest time as possible (to avoid overcooking). I can’t believe that something so simple could taste so ? I made these for my husband’s bday dinner…finished thr m on the grill. Amazing! Tasted just as good as what we get ina restaurant! Thank you for the recipe ! Just wanted to say – thanks for this easy recipe! It’s just so very easy to make ribs this way. And they turn out pretty darn good! It’s a whole lot cheaper than buying ribs at a restaurant – a rack of ribs at even a casual restaurant would be about $15! I can get a rack of baby back ribs that is twice the size of what you’d get at a restaurant for about $10. This just makes them so easy to make. It’s summer here now, and it’s hot – heat index frequently near 100F. Some people make ribs in the over for around 3 hours….I would melt having my oven on for 3 hours in this heat! This way, they’re cooked in the IP then just a quick broil in the oven. Easy! Yes, no more ordering ribs for me in restaurants unless I know they will be really good! So happy to hear you like this method! My wife and I saw this today and trying it for the first time. The only difference is we did applewood smoked sea salt, cracked black pepper, garlic and onion powder. We also set our IP for 18 minutes. We’ll follow up with the results. Apple wood smoked sea salt sounds so yummy. Recipe says full natural release. I read that can take 5-30 minutes. Correct? For this recipe, it will be roughly 10 – 20 minutes. Confused. I mistakenly got the 6 qt and not the 8 qt IP. We bought 4.4 lbs of baby back ribs in 2 racks. How much should I put in the 6 qt IP and at what cooking timer? Should I only do one rack and save the rest?There are only 2 of us but husband is a big eater:) Does the amount of meat make a difference in the amount of liquid? The amount of liquid will stay the same. You can make a coil with the ribs and cook them together. You will just need to add 1 minute to the desired cooking time. The less, normal, more doesn’t affect the cooking pressure. It is a pre-program function to adjust cooking time. Hi! I was wondering if there’s anything else that I can use instead of a trivet. This will be my first instant pot recipe. You can use a steamer basket or rack as well to keep the ribs out of the water. Your Instant Pot should come with a trivet as an accessories. I don’t bother with removing the membrane. I just add one TBS of apple cider vinegar to the one cup of water, salt and pepper the ribs, and cook one rack for 21 mins, two racks for 22 mins. Natural release. The membrane just melts away and helps to create about 1 1/2 cups of rich, gelatinous pork stock (it’s really yummy! ), which I use interchangeably with chicken stock. And the ribs, of course, are just as tasty! Robin, did you place the ribs directly in the water with the ACV and seasonings, or put them on a trivet? I didn’t know if the vinegar would be effective if the ribs were up out of the water and vinegar. Wouldn’t the seasonings just wash off? I’m making them now as we I type. I’m sure they will be AWESOME! Hi Amy, Hi Jacky…i just had to finally come to the site to drop you a note of deep appreciation. Tonight I made the pot roast for the second time. First time I bought a cheaper cut of meat that was on sale, just to test the recipe and see if I liked it. I LOVED IT so much, that while at costco I bought a better quality meat and it turned out BETTER than the first. I have tried a few other recipes too, all with success. The videos help me alot. It makes me happy and excited planning the next recipe of yours that I will try. I no longer have leftovers that no one eats, or expensive failed test recipes., and I even pack lunches that I enjoy eating. It’s a win/win. So a million thanks for all the work you put into testing, and sharing your recipes, I know it take alot of time and effort. I’m online tonight as well ordering another liner for my instant pot. We are so happy to hear that!! Any tips if you do not have access to an oven? The best option is to use a skillet at medium high heat. The amount of liquid will stay the same. As long as they are not packed too tightly, the cooking time can also stay the same! You are so kind as always!! What cooking time do you suggest for St. Louis style rubs? It will be about 25 – 28 minutes + Natural release. How much more time do I need to add if the ribs are frozen? I like my ribs with a lot of chew in it. (If not frozen, I would have done 16 mins). I have made this before and love how your recipe is the only one I can find where there is an option for cooking until there is some chew in the ribs. To cook frozen ribs, I would submerge it in the liquid and add 1 minute. The center can be undercooked if it is on a trivet. Can this be adapted for beef ribs? Beef Ribs will take 35 minutes + Natural release! I made these last week and will never go back to my old recipe! Thanks for your recipes and your detailed instructions. Much appreciated. thank you so much for your kind words and review on the recipe! I read all the reviews, and thought, why are so many people raving over such a simple recipe? However now I am eating it and I see why. It’s perfect. I used a steamer basket so they wouldn’t touch the liquid, I did a cup of beef broth and a half cup of beer, and I set it for 25 min. I made my own sauce which I glazed them with and cooked for 450 for 15 min. Perfection! I bought two racks and had two pressure cooker recipes to test, this one and the one from the manufacturer. I doubt I will even try that one now! So, if I pack a 10qt Power Pressure XL with ribs, I get as many as I can in there, how does that effect the cooking time? You will probably increase the cooking time by 5 – 8 minutes as packing them tightly will obstacle the steam flow. Congrats on your first Instant Pot meal and I am sure you will become an Instant Pot master really soon!! Do let us know if you come across any questions. Made these tonight in my IP, they were perfect! As good or better than a restaurant, and so much better than any I’ve ever tried to do myself. I did 2 racks, 21 minutes w/ 5 minutes NR, then opened the lid. Did about 5 minutes in the oven with a one minute broil. Used Sweet Baby Ray’s sauce with some honey mixed in. Thank you!!! Fantastic! I also used Sweet Baby Rays. Turned out perfectly when I followed the recipe exactly. The only thing I had to do differently was manually release the pressure after giving it 15 mins to release naturally (cooked for 21). Thank you for posting!! 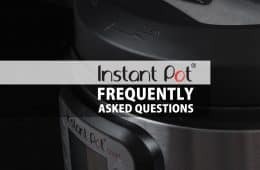 I look forward to making more of your recipes in my new instant pot. The review system is a little buggy. I have fixed the rating for you! Hi Jacky! I made these last night (using pork spare ribs and at the 30 minutes you recommended) and they were absolutely fabulous!! My entire family enjoyed them! Thank you! I’ll be making these tonight! If I’m using pork spare ribs and want them to be fall off the bone tender, should I cook for 30 minutes? Thank you! 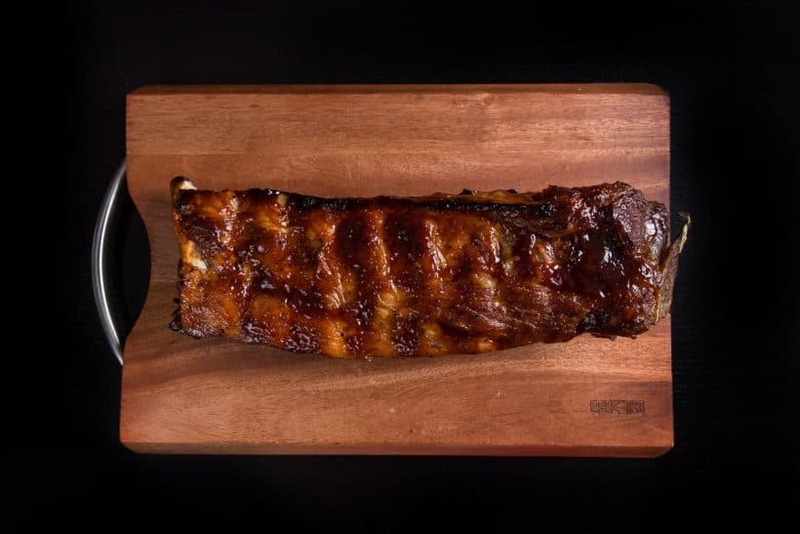 Spare ribs is more lean so it will not get the same fall off the bone melt in the mouth tenderness as baby back ribs. I am new to pressure cooking so I have been searching for fairly easy but tasty recipes! Your recipe checks both boxes! I can’t wait to try it! I was wondering when you put the ribs in the oven, do you select “broil” or ” bake”( what temperature on bake). thank you for your kind words and question! I just try to cook this ribs from your recipe. Turn out very good. 20 minutes Pressure-cook, 13 minutes in oven. This is very good recipe, for suddenly friends come over. Since it cook very fast. Also I used to live alone, before having kids. This is good weekday dinner for 1 person, not that complicate recipe and also cook fast. My husband raved! I did use some bbq spice rub before the pressure cooker, and finished with Sweet Baby Rays. Yum! Glad to hear your husband liked it too!! I was thinking about preparing these the evening before and serving them the next night. Would you recommend a particular method for reheating them, or should I cook them in the IP, refrigerate and then finish them in the oven the next night prior to serving. I actually tried a few methods to see which one preserves the ribs better. They all seem to dry out the ribs quite a bit when compared to freshly cooked ribs. I would suggest finishing them in the oven the next night prior to serving as this will be the best option. Thank you for this wonderful recipe. Don’t have the pot yet saving up but can not wait. Have a great day. Let us know if you have any questions when the pressure cooker arrives! I added liquid smoke to the water & they came out fabulously smokey and perfect! I saw above where you said it wouldn’t make too much difference but most of the flavor of liquid smoke is in its aroma (in fact the only taste from it is a vinegar-flavor) & therefore the phenolics do have the opportunity to infuse into the meat while cooking. Thanks for the recipe! We will have to try adding liquid smoke to the water next time! Yes, you can place the whole rack in. As long as it is not packed tightly, you should be able to cook 2 – 3 at a same time. Do you think adding liquid smoke to the water would give it more of a smoked taste? Adding liquid smoke to the water will only make a very minor difference as the ribs are on the trivet. I have had my IP for about a week and have been pretty happy with everything I have made in it. These were my favorite so far. They came out great! I did 20 minutes in the IP and 10 in the oven. I wouldn’t change a thing. Glad to hear you enjoyed it! Excited to try this on Saturday! I’ll be doing 8 lbs total… think it’ll fit in a 6 quart instant pot? If not, would it be bad to do two separate batches, then throw in the oven? Thanks so much for this recipe, it will be my first time with ribs! I would imagine 8 lbs is 3 – 4 racks? Some readers were able to barely fit 3 racks in a 6 QT Instant Pot. I would recommend doing 2 racks at once as packing them too tightly will stop the steam from flowing inside the pressure cooker. Happy New Year & Have Fun Cooking! great! Thank you! Yes, it’s 3 racks… I will probably just cook them separately, but throw them all in the oven together so they come out at the same time. If the 3 did fit, should I bump up my time? Thanks SO much for a fast response! It will depend on how tightly they are packed. Try coiling them around the Instant Pot. I would add 5 extra minutes if they are packed very tightly. Just ordered the IP. Not the great deal others got but I’m looking forward to trying this recipe and the others. Congrats on the Instant Pot. Hi. I am excited to try this recipe. How would you change the recipe if I were to use country ribs instead? Tonight was the second time I used my IP, and this was the recipe I used. While I don’t eat meat, the rest of the family does. I followed instructions to a “T” and they said they loved it! My hubby said to possibly season the ribs a little more before putting them in the IP, but really, he thought they were great. In fact, between my daughter and hubby, they pretty much polished them off! thank you so much for such amazing review. Glad to hear your daughter and husband liked it!!! My very first recipe in the Instant Pot! Very easy and they were so tender. My son and husband both voted to have this on our regular menu rotation. I will say that when it says to be generous with your spices on the ribs, be generous! I was worried about adding too much salt but found that I really needed more. Thank you for the wonderful recipe! Can’t wait to try the others! So happy to hear your family enjoyed it!! Help! I’m presently making your BBQ ribs now. I put 2 racks of ribs in approximately 4 pds. total. I’m still waiting for it to depressurize, it’s been 45 mins. Should I just force vent it now? Glad to hear from you again. Thank you for your question. Normally, this recipe should only take 10 – 15 minutes to naturally release. Yes, try depressurizing by turning the venting knob to the venting position. These were great! My husband loved them and wants more! Will definitely make these again. However, can I make more than one strip of ribs? It was sufficient for the two of us but what if all my kids come home — and we have five!? Thanks! Or do I have to cook in batches and then finish all in the oven at once? I think I may have answered my own question. PS why won’t the site let me rate this higher than 3? I give it a 5+! Some of our readers were able to cook 3 strips of ribs at once using the same cooking time. The rating thing is buggy sometimes. I have changed it to 5 for you. Thank you! Hi, I made the Easy BBQ Instant Pot Ribs for dinner tonight and they were absolutely delicious! Very moist and fell of the bones. The IP makes it unbelievably quick. Highly recommend this recipe…five stars for sure! Thank you. The Instant Pot makes it so easy. I have corrected the stars rating for you! 26 minutes, then covered with Sweet Baby Ray’s sauce and stuck it on 200C for 15 minutes. Only the second thing that I’ve cooked in my new IP (your Instant Pot Chili was the first) and I am HOOKED. The IP makes this so easy and your recipes are are excellent. I’m sure there will be lots more delicious food to come. Let us know how the beef stew goes. I have spare ribs. Does that change any times? Spare ribs will require about 5 extra minutes as they are not as tender. Love your pressure cooker! I have had mine since the late 50’s, and couldn’t keep a kitchen without one. Yes mine is old fashion, but the principle has not changed. Yep it’s really as easy as you show. I add a little of Stubb’s BBQ sauce to the water and apple cider vinegar to give it a little something extra. Thanks for sharing. I have a traditional charcoal grill dry rub that I made to use on these. Is that gonna jive with the pressure cooking process or no? I am using the default Instant Pot wire rack (we don’t have one of those collapsible bowls for whatever reason, so I hope to keep the ribs AND the rub out of the water. The collapsible steamer basket is an accessory we bought on amazon. I think they are also available in Ikea. A dry rub will work in the IP as we have done it in another recipe. Whoa — Amy + Jacky — I didn’t see YOUR dry rub. I used this one — http://www.weber.com/recipes/pork/classic-baby-back-ribs — I’ve used it before grilling outdoors. I like yours. The flavors seem a little more complex with the fennel and such. How much should you adjust the time if doing 2 or 3 racks? If they are not packed tightly together, the timing will stay the same. Do you use the meat function or manual function to cook the ribs in the Instant Pot? We cook ribs with the manual function as it give us more control over the time adjustment. What adjustments would you make for 1 lb of boneless beef ribs? Thanks! Our readers have successfully made beef short ribs with 30 – 35 minutes + natural release. Hello, We are Amy + Jacky! Food Lovers in our 30s who worked directly with Instant Pot CEO, Manufacturers, and 35+ Restaurants. 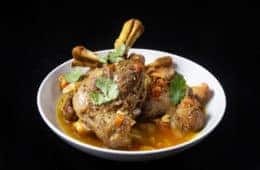 for Latest Recipes, Videos, and Tips.